Enamel – This is the hard, outer portion of the tooth that you can see. It serves as the main surface that protects the tooth from bacteria. Dentin – Beneath the enamel lies the much softer dentin, which serves as the last line of defense to protect the precious inner area of the tooth called the pulp. 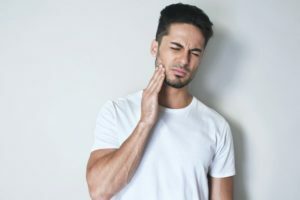 Pain – Although your tooth is dead or dying, it can still cause significant pain from the pressure that the infection puts on the membrane surrounding the roots of your tooth. This can cause painful sensations to radiate through the gums and even throughout your jaw. Change in Color – Another symptom to be on the lookout for is a change in the color of your tooth. A dead tooth will typically get darker, appearing yellow, gray or black. This is a result of the absence of a healthy blood supply. Root Canal – If you have enough healthy material left, your dentist will be able to perform a root canal procedure to restore your tooth. This involves making an incision in the tooth and then removing the decayed tissue in the pulp, then cleaning, filling and sealing it. Tooth Extraction – If there isn’t a sufficient amount of material remaining, your only option may be a tooth extraction in Brookfield. Your dentist will numb the area and then remove the tooth. Unfortunately, this will leave an empty space which could lead to your other teeth shifting over time. Thus, if you have an extraction, it’s best to talk to your dentist about ways to replace it. Death is never fun, nor is it desired. So to prevent your tooth from decaying, be sure to practice excellent oral hygiene, which includes brushing and flossing at least twice a day to remove harmful bacteria. If you find yourself suffering from any of the above symptoms, though, don’t hesitate to reach out to your dentist to schedule an appointment. A graduate of the University of Minnesota, Dr. Brandon A. Brunner has been practicing dentistry for over 15 years. In addition to general dentistry, his focus is endodontics, oral surgery and cosmetic dentistry. Dr. Brunner practices at Elmbrook Family Dental and can be reached for more information through his website.